A personal experience of working with this modality and the results that are possible when dedicating energy to this work. February 06th 2010 - Quantum-Touch® therapy works on several premises, firstly that humans are hardwired to be in perfect health. This means that wellness is our natural state, and given the appropriate set of conditions, our bodies know how to heal themselves. Secondly, as bodies of energy, we realize that energy follows thought, and blood flow follows energy flow. You will have noticed this to be true when you put your attention on part of your body and become aware of that part becoming warmer, or tingling, or in some other way, showing that increased energy is going there. It would follow, therefore, that human beings are intended to live in high level wellness, and that if we create that space and intention within ourselves, then all conditions contributing to lack of health would simply disappear. I initially became aware of Quantum-Touch therapy when Richard Gordon introduced his new energy healing modality to a large group of holistic practitioners at a conference at the University of Toronto in 1998. When I rediscovered Richard’s work in 2002 and attended a weekend of training in Montreal, I knew that I would use this simple, yet powerful model and help others to learn about this work as well. I held an image of families using energy healing as a regular event in their homes, and I could see children doing hands on work in the school yard to help each other when injured, physically or emotionally. Another favourite image was that of children energizing water, plants and seeds and sending energy to schoolrooms around the world. I knew when I found Quantum-Touch that I had found the model I was looking for, a model that was easy to learn, inexpensive to offer and to teach, and was highly effective. I knew the value of energy work in my own life, and I wanted to share this with others. Energy healing first entered my consciousness following several weeks of overdoing high mountains while living in Switzerland. I had spent a few too many days jumping over crevasses, and developed painful bursitis in my left hip. After 18 painful physiotherapy sessions and a pharmaceutical that caused gastro-intestinal bleeding, I decided to find another way to wellness. I was referred to an alternative practitioner in France who did a few very gentle manipulations, and then held my head for 20 minutes or so. After four sessions, the bursitis was completely gone and there were no side effects, leading me to decide that I needed to find a way to do this work as well. I returned to live in Ottawa, and although I was an accountant working as a finance officer and auditor in government, I spent one weekend per month for a year, learning a modality being taught here at that time. Following the initial training, I learned several other modalities always searching for something simpler, a modality that I could teach to others quickly, yet effectively. In 2002, I was again introduced to Quantum-Touch therapy by a client wanting to find a book about the work I was using at that time, Polarity Therapy. Richard Gordon’s book, entitled Polarity Therapy: Your Healing Hands was recommended, however, she came back with the Quantum-Touch book instead. Upon hearing this, I checked the website, registered for a training taking place in Montreal the next weekend. My life had been definitively changed. In the early days of Quantum-Touch, there were few instructors and those who were doing training were found in California and Colorado. The instructor in Montreal was just visiting, and I would need to travel to learn this modality. Early on in the process of evolving Quantum-Touch therapy, Richard decided to make the work easily accessible to everyone, and had developed the video workshop that could be used as a teaching tool, and to bring the work to others who would be interested in learning it as well. The requirement was that I needed to offer the workshop to at least three others and then I could count it as a workshop for myself. In early 2003, I began offering the video workshop to interested energy workers. I became an instructor in June 2004, and have since then taught hundreds of students as well as seeing at least a thousand of clients. I have truly reveled in the potential for this very simple modality to change our lives in many ways, and in fact, during an experiment at Mooney’s Bay in the summer of 2005, a small group of Quantum-Touch practitioners, worked for 1-1/2 hours and the environmental lab tests showed a result of 86.5% reduction in the e-coli count following the experiment. We know from taste tests during the class that a molecular change takes place when energizing a glass of water for four minutes. The work is truly amazing. As observed during that past weekend of training, wellness is our natural state, and provided with the opportunity, our body, mind and spirit will take this increased vibration and heal itself. As practitioners we learn to do the breathing and to use the techniques to move life force energy, then we hold the space and allow the healing to take place. The system of the client is responsible for taking up the energy and healing the body. You can imagine how amazing it is to observe swollen joints, torn muscles or cranial bones moving beneath your hands as they take the necessary steps to heal themselves. I’ve felt bones moving, muscles rippling and reorganizing themselves, swelling reduce, pain levels reduce, and even concussion from head injuries move into that place of healing under my hands. Miracles become an everyday occurrence, as we begin to understand how working with vibration and intention can create the space where this healing can happen. This work has been done with clients suffering heart attacks, babies born with fetal alcohol syndrome, people suffering from fractures. There is evidence that few limits exist where the potential for healing is not a possibility. Not everyone will become well, however, in my experience, most of the clients I work with have found the healing they wanted, with few visits, and virtually no side effects. This work is easy to do, highly effective, simple to explain and to learn, and available to everyone who is interested and inspired to work on their own wellness. In fact, adolescence are the next large group to become involved in this modality. Instructors of Quantum-Touch are now able to offer the course at half-price for students under 18 years of age. Assisting family members with pain or other conditions, as well as energizing water, plants, and their food are highly motivational and inspiring possibilities for youth. I envision a world where everyone is using techniques such as those taught in the Quantum-Touch workshops for wellness at all levels: increased physical capability, enhanced immune systems, resistance to aging, energizing plant growth and water, increased bonding between friends and within families. Just imagine a world with these possibilities!!! Yes!! Take a few moments and just imagine!!!!! 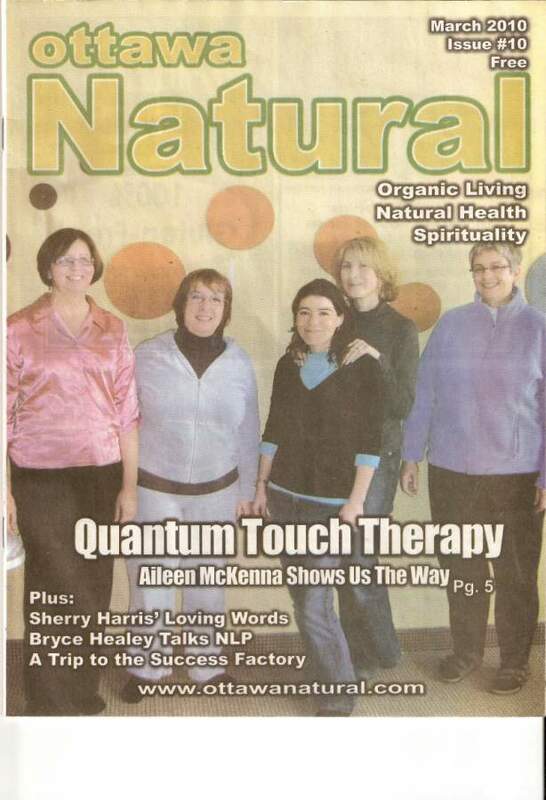 Aileen McKenna offers a certificate training in Quantum-Touch therapy regularly throughout the year in Ottawa as well as in other places in Canada and abroad. Students of Quantum-Touch® therapy are always amazed at the results they observe during the very first morning of the training. She also offers a workshop called Grounding and the Art of Creating Sacred Space. Information on workshops available please check our the website at www.aileensoasis.com. Aileen has a private practice where private sessions are available as well as distant healing sessions. For further information and registration, please contact Aileen at (613) 228-2272, (613) 795-3751, or by e-mail or aileen.mckenna66@gmail.com . For those calling from out of town you may call toll free at 1-866-493-0236. You can also visit the website at www.aileensoasis.com, or the Quantum-Touch website at www.quantumtouch.com.